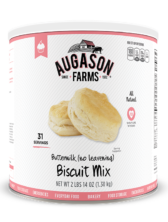 Augason Farms Buttermilk Biscuit Mix is blended from top quality ingredients for baking those perfect, flaky biscuits everyone loves. Quick and easy to prepare – just add water and baking powder. Amazingly versatile, this can be used to make dumplings, breakfast sandwiches, pie and pizza crust, parmesan bread, even cinnamon rolls. Of course, an all-time favorite is biscuits with sausage gravy, a welcome dish anytime, making this mix handy for everyday use, as well as emergency food storage. 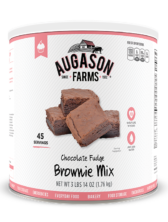 Augason Farms Chocolate Fudge Brownie Mix makes a rich, moist brownie full of delicious chocolate fudge flavor. Just add water or combine with additional ingredients to make chocolate cookies or chocolate cake. A chocolate lover’s delight, this classic brownie mix is certain to please. Honey powder, like liquid honey, can be used as a flavoring or sweetener. It provides the typical flavor characteristics of honey, but with a 30 year shelf life. 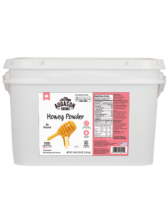 In the powder form, the consistency is easier to handle than liquid honey. Use for dry rubs, cereals, in hot and cold drinks, and on nuts and seeds before roasting. Reconstituted it is delicious on breads, rolls, or muffins. With this special offer you will receive three (3) Augason Farms® Buttermilk Pancakes Pantry Boxes. $180 Value. 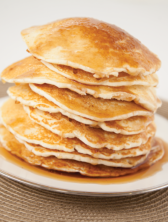 Augason Farms® Buttermilk Pancake Mix is made from high quality ingredients that are blended to perfection. All you need to do is add water to prepare them. Full of wholesome goodness and irresistible flavor. Includes twelve (12) pouches. 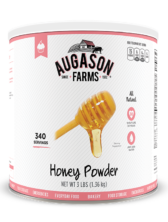 Augason Farms Shortening powder is perfect to use anywhere you would use shortening, for that fluffy and flakey texture people love—especially in pie crusts. The ease with which it blends into other dry ingredients makes mixing a dream, and there’s no need to hydrate it first. Does not require refrigeration, and has a much longer shelf life than ordinary shortening, which can quickly go rancid. These virtues make Augason Farms Shortening Powder ideal for everyday use as well as emergency food storage. 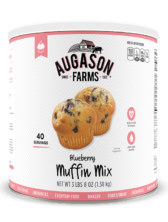 Augason Farms Blueberry Muffin Mix is simple to make, and it’s full of flavorful blueberry bits. A baking classic with a touch of homemade goodness, these muffins are a welcome treat with the sweet taste of just picked blueberries. The tantalizing smell of baking muffins makes for a happy day, anytime. Delicious by themselves, or try the recipes on the can to create mouthwatering desserts.Consider baking them for everyday treats, as well as for long term food storage. 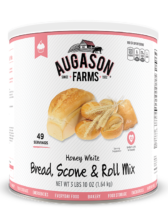 Augason Farms® Honey White Bread & Roll Mix is a delicious, nourishing mix that can be used in a variety of ways. It is simple to make, just add water, oil, and yeast. There’s nothing like the enticing aroma of baking bread or rolls. 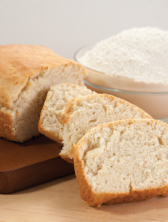 Augason Farms® Honey White Bread & Rolls Mix is a delicious, nourishing mix that can be used in a variety of ways. It is simple to make, just add water, oil, and yeast. There’s nothing like the enticing aroma of baking bread or rolls. Their satisfying flavor and texture is filling and nourishing. Use this handy mix for everyday bread making as well as for long term food storage.